This week, the Tourist office delivers you the second article of its series of personalities' portraits having marked with their imprint the local history of our territory. 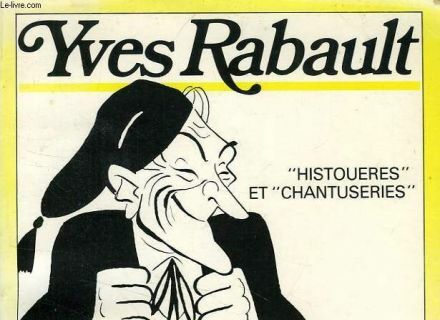 The character, whom we crunch today, is called Yves Rabault, the bard of the folklore from Poitou. The genesis of " When you make me some sauce for lumas "
Yves Rabault was born in 12 way of Saint-Séverin, to Marigny, a small rural district in border of the forest of Chizé. Stemming from farmers' family, is nicknamed the bard from Poitou in the 30s. His " Histouères and chantuseries ", appeared in 1982 and introduced by Léon Zitrone, is the collection of all its work of which celebrates his " Sauce in Lumas " written in 1940 on the air of " When we like both " of Vincent Scotto, an idea come in 1934 while he occurs in Paris in the Vault of the Republic, in the Agile Rabbit, in the Theater of Both Donkeys, in the Cuckoo or in The Red Moon; a song which will make the tour of France! 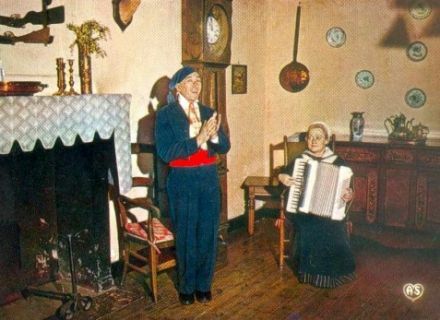 He remarries in 1965 with Simone Suzange, pianist-companion and star of the Parisian cabarets who creates a music and dancing school to Marigny. He takes then the management of the Productions Paris Variétés created by his wife; receives in 1973 the price Georges Chepfer awarded to the best poet-chansonnier patoisant of the year. After a well livened up career, he rests from now on in the cemetery of Marigny. 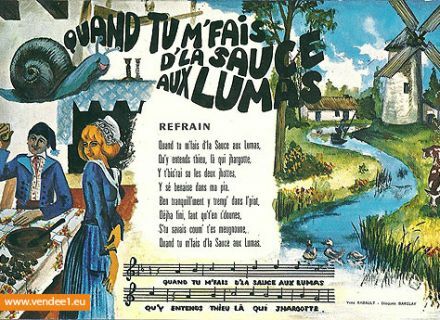 What the "luma" in Poitou? Named " luma " (*) in Poitou and in Aunis, " bavou " in Deux-Sèvres and "cagouille" (*) in the Charente, It is the garden snail, the snail from 30 to 40 mn weighing 6 in 18 g. whose French bastions of the snail farming are Cavaillon, in Vaucluse and Charente-Maritime; the Poitou-Charentes remaining the best producer, even if the gastropod lends itself badly to the breeding which is then marginal. (*) of the Latin "limax" giving slug, snail. (*) Of the "silly" Latin meaning cowl, hood. Ingredients: 300 snails, of the parsley, the onion, the clove, the garlic, the shallots, the salt, 200 g. of fresh lardons and some red wine. 30 mn of preparation and 2:30 am of cooking. 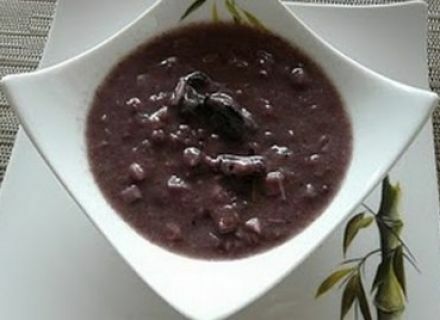 Make youngs-grey fast during about ten days. Clear them into some water with vinegar and salty. Rub them the ones against the others to wash them. Cook them during 1 hour in some boiling water salty and flavored with a bunch of parsley, an onion dotted with a clove and a head of garlic. Get back in a pan lardons, shallots and garlic, then cook them hanging 5 mn. Pay above the warmed wine and let simmer during 1:30 am. Food of the "lumas" every day allows to achieve spryly on the 100 years! Photo credits: "Yves Rabault's native House" (OTNMP, on 2014), "Yves Rabault and Simone Suzange on stage in an inside from Poitou" (Unknown author), "Histouères and chantuseries" (Publishing of the country), "When you make me some sauce for lumas" (www.vendee1.eu) and " The Sauce in Lumas " (blog Le Monde of Linou).